It's the G933, but without the LEDs and the strange angles. The newly announced G533 might be Logitech’s most attractive headset yet. And yes, I mean that both in terms of aesthetics and performance. Not only is this thing packed with must-have features, but it’s damned nice to look at. If you were a fan of previous designs, don’t worry. Everyone will still know this one’s made by Logitech when they glance at it. The coffin-shaped earcups give it away. 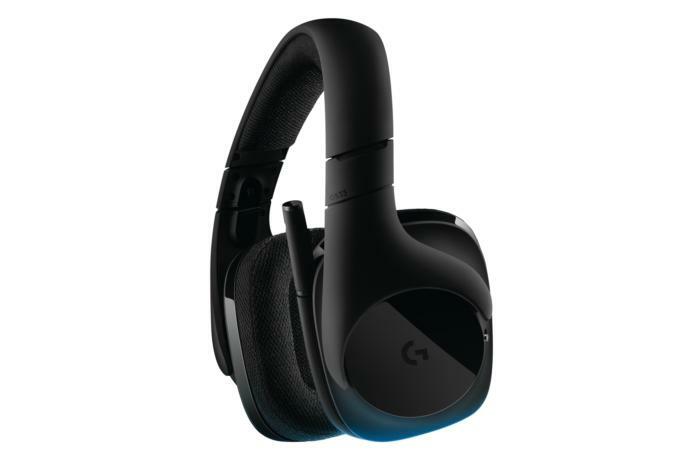 But while the G633 and G933 resembled a crazy cyberpunk scorpion (or something) with their oblique angles and flashy LED highlights, the G533 takes a more reserved tack. Some might even call it professional. I’d compare the situation to that of Logitech’s G910 and G810 keyboards: The former was a purposefully edgy “Gamer” keyboard, but you could bring the latter the office. Smooth, sleek, and jet black, the G533 combines the elongated profile of the G933 with a classic circular panel on each earcup. Overall, it’s an odd shape, but one I’ve actually warmed up to the longer I’ve stared at it—seemingly both retro and modern at the same time. I bet that piano finish picks up a lot of fingerprints, though. My one complaint is that Logitech continues to use mesh earcups for all its products, without the option to swap to leatherette. With a headset this gorgeous, I’d really prefer the premium feel of leatherette—or at least the option of having it. That said, you do get a beautiful, no-nonsense design, and one that comes finished off by a flip-to-mute microphone on the front at that. 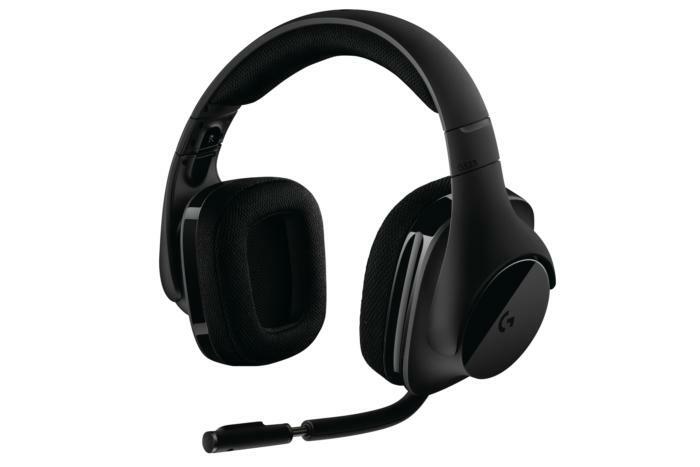 Sure, the microphone isn’t detachable, nor is it quite as discreet as the G933 (which allowed you to stealthily fold it into the earcup), but it’s a good-looking headset even if you only ever use it at the PC. As far as features go, Logitech’s revamped its Pro-G drivers a bit. We haven’t had a chance to go ears-on with the G533 yet, so I can’t speak to their quality, but Logitech claims both highs and lows should ring through with less distortion. The G533 also comes with 7.1 DTS Headphone:X, though not the dual DTS and Dolby options of the G633 and G933. The G533 uses the same wireless tech as the G933, which I’ve never had a problem with. Range is advertised up to 15 meters, or around 45 feet. 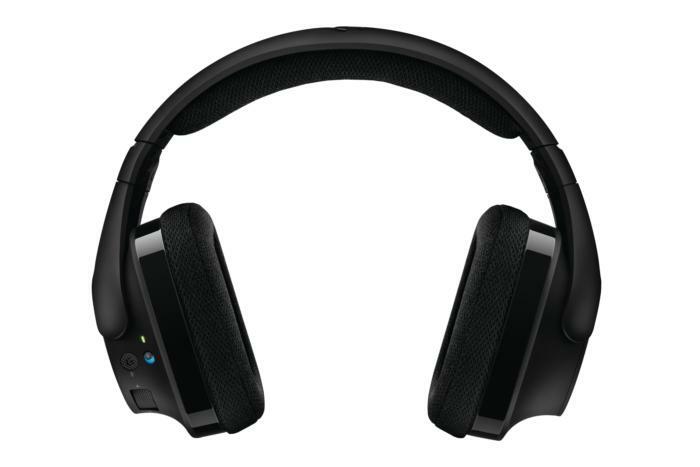 Battery life is also equivalent to the G933, with up to 15 hours. Last up is the microphone, which was one of the less impressive bits of the G933 package. Again, we haven’t had any hands-on time yet, but Logitech claims it’s improved. The most obvious new feature: a minuscule pop filter. Most of the stick-like microphones we see on headsets are bad about picking up bursts of air on “P” and “B” noises (called “plosives”). Normally, manufacturers solve this issue by putting a piece of fabric or mesh in front of the mic, but that adds bulk. Normally. Logitech has designed a pop filter that’s about the size of a small pea, and it sits recessed in the boom arm so the whole thing still looks slim and sleek. When we get hands-on time, we’ll for sure be testing how this pop filter performs. The G533 ships later this month, with a retail price of $150. We’ll have a review soon, but at the moment? I’m excited. I already thought the G933 was a bargain—one of the best wireless headsets on the market for a little over half the price of the A50s. Now Logitech’s knocked another $50 off the list price. Great wireless headsets are getting cheaper every year.